ROAD TOWN, Tortola, VI- The commitment towards the best interest of the Virgin Islands by Premier Dr The Hon D. Orlando Smith has come into question by co-host of the Things to Talk radio programme Julio ‘Sam’ Henry. Speaking on the radio programme on ZBVI 780 AM on Thursday November 3, 2016 Mr Henry said he had to put that concern out to the public. 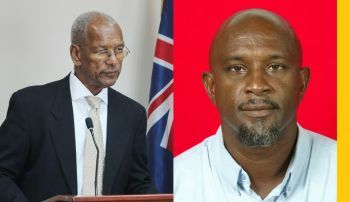 He pointed out that when Premier Smith travels to a country like China that does not respect human rights, that does not respect the environment, that has the biggest and most powerful protectionism policies in place, and he makes statements such as, “he does not believe in protectionism for the BVI,” Henry stated that this is what he mean and sought to bring it into clearer focus. He said it is public knowledge that Premier Smith has a private medical practice. “What if Julio Sam Henry becomes the Premier tomorrow and decide to flood this country with doctors’ offices just like his who can do a better job at a cheaper rate than his, you think that’s right?” he asked. He argued that the biggest countries like the USA, China have protectionism in place. “I have a serious question, be honest, does the Premier, our Premier Dr. D Orlando Smith, does he really have the BVI interest at heart?” Mr Henry asked. He said he is aware that this will hurt some because they are going to say how can he ask that question bearing in mind that the Premier is doing all this and all that and he agrees that he is working hard to protect the Financial services to which he partially approves and he is working hard to bring in more high-end tourism in the country because he can see it and is aware, however, the question has to be asked. Yes he does Sam he is not you bringing down the country with your negatives, people like you could never get my vote Sam. Soon Tortola is going to be called China Town. He is blocking the sale of rite way as we speak so maybe that is the protectionism that he is referring too? @on the same token. Smith is not blocking the sale of Rite way. For Smith Alone Rite way will done be sold..The others are the one blocking the sale .. If they just stop and think and ask the people at Rite Way what they want.. 90% is for the sale. If its one thing I learn about NDP. They don't care what the people think..They don't listen, It's all about them and what they think. Just a small percentage who against the sale making alot of noise.. How come a man cannot sell what is his.. What he work so hard to build to who he wants? OMG.. It's Crazy in this place. Why they don't stop the banks from selling BVIsanders Ceased properties to expatriates? It's Crazy in this place. OMG..
Haycraft so frustrated. He almost die. The polititians almost kill him. He is so disappointed in Locals and dont trust them. He actually give a Filipino the company to Run. Can't blame him for that. He is hurting.. Them out deh hustling business for the good old boys club. We have to follow the money. Or get left behind. Tell me a Caribbean country that isn't looking to China for help? Does that mean they do not care about their country... China is the only country in the world that gave help without dictating.. America giving help they want laws so CIA and FBI and walking anytime and do what they want. England they don't have it...China give help but they don't interfere.. They have a few rules like supplying materials and some skill workers.. Isn't that better than cutting 400 Civil servants that the IMF would ask us to do... U didn't do your home work on this one Sam. China literally actually taking most of Africa out of poverty..
Sam you are wrong. This one of the best move the Government done so far on behalf of its people.. Just imaging we go to the IMF. And is told if we need that loan we have to cut our Civil service in half. I'm from SK. I can tell you why SK turn to China. Because the IMF demands that SK cut 400 Civil Servants and Dougie decided no way. Keep your Money.. That's how we ended up going China. Every body keeps their jobs we added more jobs and SK on its way up. Clueless!! Sam, we have BEEN open for business to Asia! Who do you think own most of the 500,000 companies incorporated here at the Companies Registry? The BVI cannot run off foolish emotion so cut the BS. You guys have no clue how the BVI became what it is and always spouting this nonsense. Educate yourself about how your country works and how we are able to be the prosperous nation we are. It didn't come about from sand, sea and coconut water!! ones but does that mean you should run? Not necessarily, however you have a right to express your views and help keep the managers on the straight and narrow. That is our duty. And the administrators(I hate to use the word politicians because they begin to believe that) are obliged to listen. Mayor Koch of NY used to ask "how am I doing? ", he wanted feedback from the people so he can make adjustments accordingly. Criticism is required. We don't have to run for anything, we just have to tell them what we want. The BVI will always be dependent, because they never save or invest any of the money that they bring in. If we were investing over the last 40 years, we would have over $5bln by now. The people that government is listening to want us to be dependent but government can't see that: they are looking for a way out of their financial predicament. How can you be independent if you are always looking for someone to save you and depend on; i.e. begging. Whether its UK or China, at some point they are going to dictate, because our managers don't understand management. Let us not fool ourselves, China also has a history of draconian treatment of their own people and others. So we may be jumping from the frying pan into the fire. Do we think Chinese are not going to demand audits? I don't think so. Let us audit our finances and move on. We cannot move on without that. China, no doubt is an emerging economic and world power. The Caribbean( West Indies) has lost or is losing its strategic value. The break up of the USSR and its threat of helping regional countries lessening, the US seems to have have lost interest in the region, creating the opportunity for others such as China to fill the void created. China is taking advantage of the void; it is not showing its interest for nothing. The region is starved for external investment. And China has surplus cash to offer grants or no or low interest loans. For those loans, China requires in most cases for countries to buy Chinese material and equipment, employ Chinese workers on projects, and requires relax immigration requirements for Chinese citizens. Further, at the UN and other bodies, China expects support from these countries on votes. Thus, it is imperative that any agreement with China be win-win. The BVI must show strength and patient, not desperation. Be vigilate.